It's rare to find a novel that is so complex yet so easy to follow, but Tigers in Red Weather is definitely one of them. It documents the lives of a family over three decades during the mid-twentieth century, focusing on six individual members. Five of them have a section of the book dedicated to their own point of view, so you get to witness how significant events are seen through one person's eyes as opposed to another. Although the jumps from character to character are well choreographed, it can still be a little confusing at the beginning. There are also jumps in time – one chapter you can be in 1967, the next in 1945, and then perhaps in 1958. But once you get your bearings, it becomes very easy to enjoy. It also helps that the narrator makes pop culture references that are relevant to each iconic decade, which is marvellous because you get a real feel for the time periods. I just thoroughly enjoyed this book. Though I knew there was a murder involved, it was still much darker and more diverse than I expected it to be. I loved the mystery, the suspense, and the undeniable glamour. The characters are complex and intriguing, and you end up caring for a lot of them. It's fantastic to see their personalities and relationships evolve as the years move on, as well. 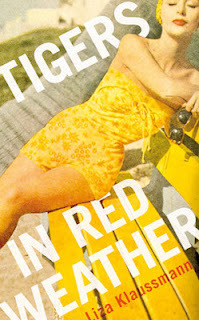 Tigers in Red Weather is a novel that is going to stick in my mind for a long time. If you're looking for a well-written, glamorous summer read with a vintage feel, wonderful characters, and a plot to die for (pun intended! ), I wholeheartedly recommend this.